Hezbollah leader warns Israel against attacking Lebanon or Syria. Hezbollah leader Hassan Nasrallah on Friday warned Israel against attacking Lebanon or Syria, claiming that "hundreds of thousands" of Arab and Muslim fighters would be ready to strike back. "The Israeli enemy should know that if it launches an attack on Syria or Lebanon, it's unknown whether the fighting will stay just between Lebanon and Israel, or Syria and Israel," Nasrallah declared, in comments quoted by the AFP news agency. "I'm not saying countries would intervene directly -- but it would open the door for hundreds of thousands of fighters from all around the Arab and Islamic world to participate in this fight -- from Iraq, Yemen, Iran, Afghanistan, Pakistan," he said. Nasrallah made the remarks in a speech broadcast on television to mark the Iranian Al-Quds Day, an annual show of solidarity with Palestinian Arabs which Iranians use to threaten Israel and call for its destruction. The commemoration was first launched by Ayatollah Ruhollah Khomeini, the late revolutionary leader of Iran, which is Hezbollah’s main benefactor. In his remarks, Nasrallah also stressed the importance of the Palestinian plight for the Arab world. 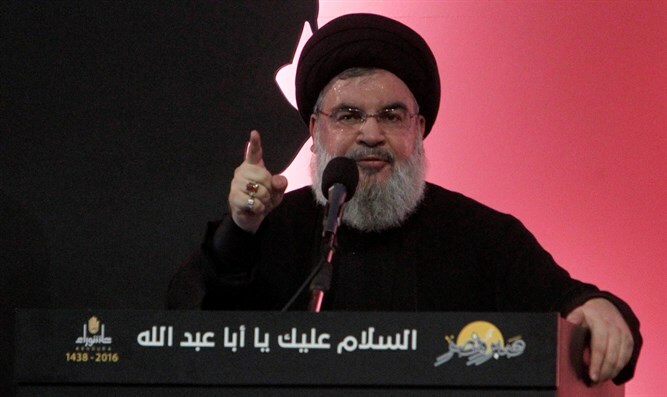 The Hezbollah leader mocked Saudi efforts to normalize ties with Israel, reported Haaretz, noting that regardless of these bids, "all Arab nations oppose normalization with Israel which means most of the nations support the axis of resistance and the fight against Israel." He also accused Israel of trying to pressure Palestinian Arabs to capitulate to its and the Americans' demands, but said that won't happen if the "axis of resistance" continues to grow stronger. Nasrallah regularly threatens Israel, despite having been forced to live in an underground bunker since the 2006 Second Lebanon War – a fact which he denies. In February, he warned Israel to “count to one million” before waging a new war on Lebanon, stressing that Hezbollah will not abide by any “red lines” in any future confrontation. He previously said the group's rockets had the ability to strike the nuclear reactor at Dimona and its military infrastructure, as well as the Haifa ammonia tank. A year ago Nasrallah threatened to strike the ammonia storage facility which he described as “Hezbollah’s nuclear bomb”. Earlier this year, the head of Israel's air force warned that it would have "unimaginable" military power at hand in any future conflict with Hezbollah. "What the air force was able to do quantitatively in the... Lebanon war over the course of 34 days we can do today in 48-60 hours," Major General Amir Eshel said on Wednesday. "This is potential power unimaginable in its scope, much different to what we have seen in the past and far greater than people estimate," he added.